After years of testing, South Korea opened the Incheon International Airport Maglev in 2016. The automated 6.1-kilometer system is free to ride and operates between 9 am and 6 pm. Four two-car trains run every 15 minutes, with up to seven trains available for operation. 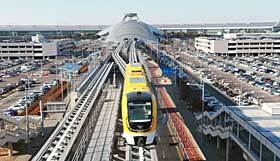 Trains can carry up to 230 passengers and run at speeds up to 80 kph. The technology is designed to operate at speeds up to 110 kph. South Korea began efforts to commercialize maglev transit in 2006. Korea Institute of Machinery and Materials, Korea Rail Network Authority and Hyundai Rotem were some of the twenty agencies and companies involved in the development.